The CNL’s library, which specialises in Luxemburgensia and holds over 40,000 books, is a reference library; the books may only be consulted in the reading room. 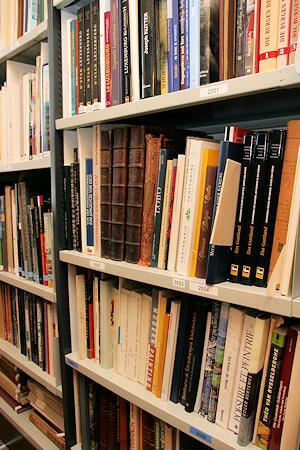 Our specialised library contains books from various collections, books on subjects related to literature such as history, philosophy or music, as well as works of literary criticism. As a visitor you have open access to general reference works (encyclopedias, bibliographies, etc.) and specialised reference works (dictionaries, works on the history of Luxembourg, the history of literature, etc. ), daily and weekly Luxembourgish newspapers, as well as a number of literary and historical magazines from Luxembourg and abroad. We also have an important number of audiovisual documents on literature in general or on historical aspects of literature in Luxembourg. The CNL also collects press clippings on over three thousand people and organisations of the Luxembourgish literary world. Please note: The CNL’s library is a reference library meaning books may only be consulted in the reading room.